Try this dish with Reduced Sodium Roasted Chicken Base; Organic Roasted Chicken or Organic Mushroom Base. SAME COOKING TIME AND TEMPERATURE APPLIES WHEN USING A CONVENTIONAL OVEN. Preheat the Big Green Egg® to 400°F. Set EGG® for indirect cooking with the plate setter and porcelain grid. Mix the Roasted Chicken Base, Mushroom Base and garlic powder together in a small bowl. Rub each Cornish hen with the mixture and set on a work surface. Add the butter to a small pan over medium-high heat. Add the leeks and black pepper to the pan and cook for 3 - 4 minutes. Add the cracker crumbs to a medium sized mixing bowl. Add the leeks, Roasted Chicken Base, grapes and Brie cheese. Toss to combine. Divide the stuffing evenly and fill the cavity of each Cornish hen. 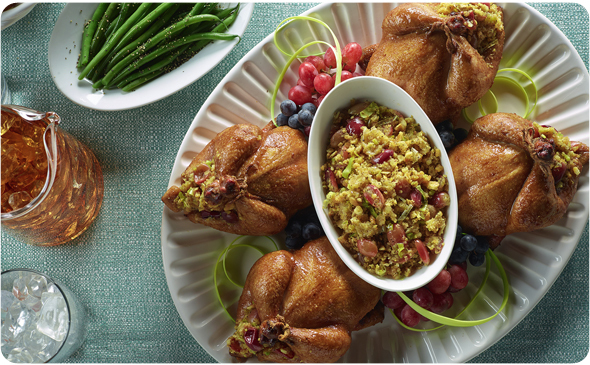 Place the Cornish hens onto a grill-proof rimmed pan. Place the pan directly onto the EGG. Roast the Cornish hens for 1 hour and 15 minutes or until the internal temperature reaches 170°F when checked with an instant read thermometer. Carefully remove the Cornish hens from the oven and let rest 10 minutes before serving.